Latest NSC & PPF Rules for NRIs | How to close PPF a/c? PPF and NSC are the most popular long-term saving instruments in India. The amount invested in these instruments is eligible for deduction up to Rs 150,000 under section 80C along with other eligible investments. The Govt. of India has recently revised investment rules relating to the investments by the Non-Resident Indians (NRIs) in the select Small Savings Schemes – PPF (Public Provident Fund) and NSC (National Savings Certificates). 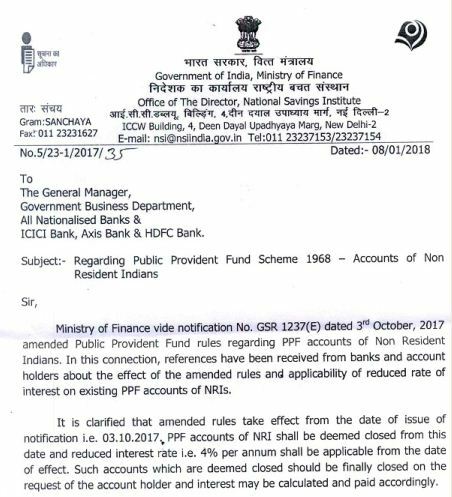 Latest update (23-Feb-2018) : The Govt’s notification dated 3-Oct-2017, regarding closure of PPF accounts held by NRI has now been put on hold. The Govt has issued a latest notification on this as below. So, NRIs who currently hold PPF accounts can continue their investments in PPF accounts until further notice (if any). As per the new notification it has been simply been put on hold. A separate notification has also been issued in respect of the National Savings Certificate (NSC), which states that an NSC is deemed to be encashed on the day when holder becomes an NRI. Who is considered as an NRI? – A person is considered resident in India, if he is in the country for 182 days (or) 60 days in a year and 365 days in each of the preceding four years as per Income Tax Act. When a person doesn’t satisfy both these conditions, he/she is termed as NRI. If your Residential status is NRI and you have made investments in PPF and/or NSCs then you need to be aware of the below revised rules. Existing rule : NRIs cannot open a new PPF account in India. However, they were allowed to keep contributing to their existing PPF accounts as per a 2003 notification. This was for the PPF account they opened prior to becoming NRIs. When you become a Non-resident Indian, your PPF account would be deemed closed. From the date you become NRI, your PPF would not earn the regular interest rate (current prevailing interest rate on PPF is 7.8%). Do note that the deposits earn regular interest rate till you turn NRI. Subsequently, until you actually close the account, your PPF deposits would earn the interest rate of post office saving account only. The current interest rate of PO savings account is 4%. Existing rule : NRIs can not invest in any of the Small Saving Schemes like NSCs, KVP, SSA etc., However they were allowed to continue with their existing investments in NSCs till the maturity date. New rule : It is deemed to be encashed on the day the holder becomes an NRI. Until the time you actually encash NSC certificate, the accumulated money will earn interest at a lower rate, as applicable to Post office Savings Account (which is currently 4% p.a.). How an NRI can close PPF account? You need to complete PPF withdrawal form (Form C) and arrange for your KYC Documents (like copy of ID & address proof, cancelled cheque etc.,). Along with the above documents, you need to enclose an authorization letter stating that you are allowing your person (relative/friend) to submit the withdrawal forms on your behalf. Post all these documents to your representative. Your person has to visit the bank where you have NRE/NRO account. They have to get all the documents attested by the bank official (especially the authority letter). He/she can also get these documents attested by a gazette officer. After attestation is done, then your representative can visit the PSU bank for PPF withdrawal. So, what should NRI’s who have PPF and NSC accounts do now with their accumulated corpus? – I believe that NRIs should withdraw their funds in PFF/NSCs immediately (or during their next visit to India) and invest in other suitable/better investment avenues. As an NRI, before you consider any other investment alternative, suggest you to kindly know the current tax rules that are prevailing both in India and foreign country (especially rules related to ‘repatriation’). What is FATCA compliance requirement? Is an Aadhar card necesary while closing a PPF account by a Citizen of Indian Origin? Thanks for your reply. I believe that it is not mandatory, but you may have to submit a valid ID proof at the time of closing the account. I am an NRI and my NSC got matured recently. I bought the NSC when I was in India. I am not returning to India soon and I want my father to encash the money on my behalf. The post office is not cooperating and stating that I need to be present to encash the NSC. I read online that legal heir can opt for encashment upon submission of form SB84. I also read all the questions and answers in this section to see if you have already responded to similar questions before but did not find one. Could you please help me with the encashment process. I believe that SB84 form is used only in case of Death of investor for claiming the proceeds by nominee/a relative. I also believe that you can send an authorized representative with original NSC, signed authorization letter, your bank account cancelled cheque etc., and can get the NSCs encashed. My son is NRI from 2008. He opened a PPF a/c in capacity of Guardian of her daugher in 2012 with SBI. PAN Card and Aadhar card was submited at that time. The Ruling for NRIs was not in notice so the NRIs status was not disclosed at that time.Now, he wants to close this account. What shall be the treatment of Interest payable on this account. Please advise. The Govt Notification (dated Oct 2017) has been kept on HOLD for now. NRIs can continue with their investments for time-being. Suggest him to keep his PPF ac in active mode by contributing minimum amount every year till further notice or any new notification gets issued. Thank you dear Omkar, for sharing this link! I am planning to migrate from India soon expected to be in march 2018. I have a PPF account with SBI bank. will i get my money invested back in hand if i close out the PPF account before i travel abroad by .showing the VISA . 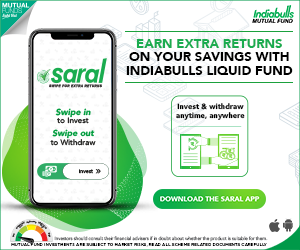 I believe they will issue a cheque for the withdrawn balance and that needs to be deposited in NRE/NRO account I believe, as NRIs are not permitted to maintain regular Indian rupee savings account. Ohkay, so does that mean I cannot encash the cheque without a NRE/NRO account?? I believe that PO/Banks insist on having Savings account to withdraw the funds. I doubt encashment is allowed. This suspension looks temporary . The intention seems to be to not allow NRIs to invest in PPF . My question is if there is no new development until the first week of April, as an NRI, can I deposit new funds into my PPF account? Should I risk a new deposit given the previous directive of 4% savings rate since the date you become an NRI? My suggestion would be not to make any major contributions to your PPF ac, but you may just make minimum contributions to keep it ACTIVE. You may better off looking out for other alternative investments to PPF. I am an NRI , I open ppf on my wife name on her name she do not have NRI account she has joint aacount with her father . can she continue with ppf or has to close . Dear Manish..As the account holder is not an NRI, I believe she can continue it. You will get regular PPF interest till Oct 2017, after that till the time you actually close the PPF account you will get around 4% ie prevailing savings account interest rate. There is further letter on this subject in February 2018.from the authorities.Can you please put this on this blog. Dear Raghuramlc ..If possible, can you kindly share it to me?? I am extremely thankful to you for the expert advice which is very prompt too. This will end the confusion re retrospective nature of the notification. Thank you so much for sharing the circular, much appreciated! I have uploaded the complete letter in the article. You may click here to download the same .. I am posting a problem being faced by a friend in respect of PPF & NRI and seeking a solution through your very helpful blogs. 1. He Joined IT company in India in 2003 . Opened a bank account for getting salary credited and opened a PPF account in post office in Oct 2003. 2. Has been filing income tax returns in India as per rules when employed in India. 4. When income in India became non taxable , has not been filing I T returns in India. 5. has an Indian PAN card. has been keeping the ppf account alive by depositing some amount every year. 6. The 15 th and final installment in PPF has been paid in May 2017. No more deposit is payable and the maturity value is withdrawable any time after April 2019. 7. The NRI status has not been so far mentioned in the ppf or bank account. The interest accruing in PPF account has also not been shown in US income statements. 10. has also been issued a AADHAR card during visit to India in 2015.This has not been linked to PAN card , PPF account and bank account. Declare the US citizen status now , foreclose the PPF account in post office during any visit in 2018 itself, using the US passport and US residential proof, get the money and deposit in a NRO account which can be opened at that time. Which route will be free of hassles ? 1.	is it to be reflected in US income statement & how ? 2. What is the procedure involved ? As soon as your friend became an NRI, he should have updated his residential status with at least at Bank. Maintaining regular Indian Savings account is not permissible. Also, Aadhar is not for NRIs and there is no need to link it with PAN. He can get the credit of withdrawal proceeds of PPF account into the NRO account. And balance in the NRO account can be repatriated abroad up to a limit of USD 1 million per financial year. Of course, he would need to follow certain procedure for such repatriation. Thanks Sreekanth for your blog. I have opened ppf account in 2012 . As NRI now planning to close account to comply with new rules. Believe I need to have NRO account for money be transferred into. Also has anyone successfully closed PPF at SBI. I will be traveling this month end to India, it will help me if any one has done it. I have recently received an email from one of my blog readers (as below) who has successfully closed NRI – PPF ac. He has received regular PPF interest up to Sep 2017 and after that interest @ rate of PO savings ac. As per the sub-para 2 of para-2 of above Notification, the provisions of the substituted Proviso, is applicable wef the date of its publication in the Gazett. Contrary to this view, the State Bank of India is intending to apply this Proviso from the date of becoming NRI, which may even be earlier to the date of Notification (03-10-2017). The SBI is considering cut off date as early as of 2001. 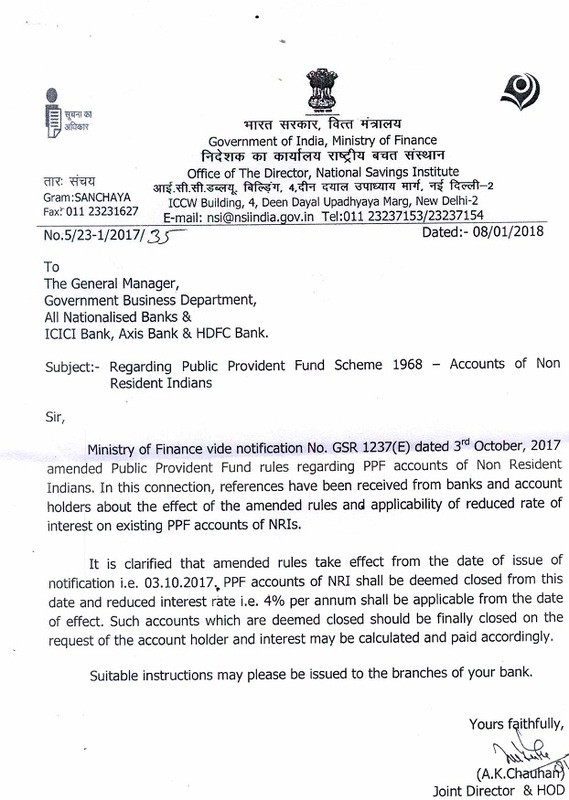 Say, if one has become NRI on 1st April 2005, than in view of the Bank his PPF a/c would be treated as closed on 01-04-2005 and from this date interest of Saving Account, viz., 3.5 to 4% would only be allowed. It is, therefore, requested to kindly guide me, so that SBI closes my PPF a/c from prospective date i.e. from the date of Notification (03-10-2017) or from the date of its publication in Gazett (30-10-2017) and not from retrospective date. An early response is solicited. I have been advised by many CAs that this notification is not applied retrospectively. You may request the SBI for any source/circular confirming that this has to be applied retrospectively. I beileve that your understanding is correct. Can claim tax exemption for FY 2017-18. Also, if you do not close the account, you get nominal interest rate (and the ac is deemed to be closed only). The ppf account opened as Indian resident will earn sb account interest when one becomes NRI later as per 30″Oct 2017 GOI notification. Pl clarify this retrospective or prospective? There is no clarity on the notification. Nobody seem to know about it. As per the notification, it says the new rules are applicable w.e.f the date of publication in official Gazette ie 30-10-2017. I believe that this is not applicable retrospectively. My query no. 1. PPF account Where holder became nri earlier than 2017, now ha s his account deemed closed on oct 17. His balance and interests he had earned at higher rates say 12,8 etc. Should not be disturbeD, in othe r words the subject circular can not be retro spective. Please enlarge on this and publish when clarity comes to authorities. Mr.A Has become nri and has a ppf ac. He remains quiet in 2017. In 2018-19 and 2019-20 he becomes Resident . Will it be prudent for him to be quiet and not close the ac in 2017. Becz I have not seen any circular insisting tha one has to periodically inform the r and nr status to account maintaining bank/Po. 1 – I too believe that this notification is not retrospective in nature. 2 – Legally, one has to inform the respective banks/PO/Financial institutions about the change in Residential status (if any). [email protected] is the email ID of responsible guy in FinMin. All write to him. Hello, has any NRI been successful in getting their PPF account closed? This is such an unfair step on part of GOI! For many NRIs who are banking on PPF as a major retirement saving, the decision to close PPF accounts is a major blow. Why should we be penalized? The banks don’t seem to have a clue on the steps forward. Request NRIs to post their experiences with banks regarding closure of PPF. Also about the rate of interest. What are the tax implications? Not everyone can come to India right away just to close the PPF. The govt should order the PPF service providers to provide PPF a/c closing option through online route for all the NRIs. They should have provided the infrastructure first and then could have issue this notification , or they could have given some time-line to close the PPF accounts. Thank you for raising this important matter in your blog. Kindly post updates , if any. Have the banks, in particular SBI, received any notifications on how to move forward with PPF accounts of NRIs? I notice that the NRI pages of the Axis Bank site still mentions that NRIs can continue with their PPF accounts! They have not updated their information. Has anyone got their accounts closed? Has anyone heard back from Prashant Goyal , the Ministry of Finance official who has issued the notification in the first place? Today, my mother visited State Bank of India (goregaon west, Mumbai) and she was told that they have not received any such instructions (though they have read this in newspaper) – as such they cannot close the PPF account and give the money. They told to check next month or come when PPF account achieves matures. Of course above is not true – it is just wierd dictatorship – many NRI lost money during demonitization as they could not make visit and could not deposit their cash. Now, banks will close PPF account after several months once Government etc notifies them and they will charge lower interest. 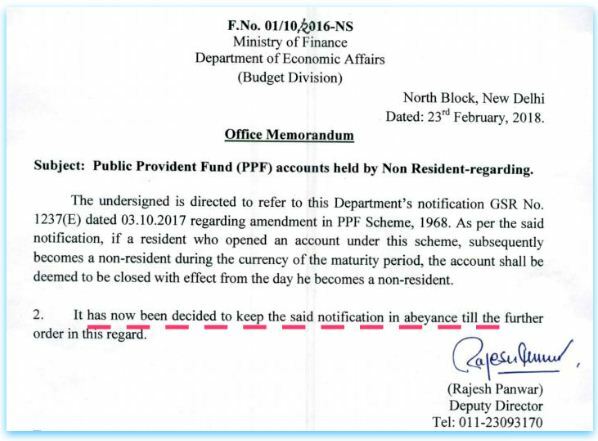 All such things should done with some planning and notice – like after 3 months NRIs can close PPF and withdraw cash and after 6 months if money is still left they will get lower interest and these are the documents they are expected to give to close the account. Very pathetic. Totally agree with you dear Dharmesh ..
Has any clarification / Notification issued by the Govt whether the new ppf rule for nri’s will be applied retrospectively or will it be prospective ? As per my interpretation and discussions with CA friends, this notification is not retrospective in nature. Dear Srikanth , Thank you very much . I had opened Ppf in May 2003 and became NRI in 2004. Now as per the notification , should I go ahead and close the account or wait till May 2018 when the ppf actually will get matured after 15 years ? Request your advice . As of now, most of the service providers (Banks/Post office) have no clue about the pre-mature closing formalities based on this notification. So, you may wait till May and get the maturity proceeds. But, do note that the regular PPF interest is payable only till Sep 2017. I am NRI.I have opened PPF account in 2016 on my name.As per new rules,now if I closed PPF account.My wife is staying in India.Can I open PPF account on my wife name ? As you are an NRI, I believe that you can not open a new account in your spouse’s name. Dear Sreekanth.Thanks for the reply. My wife is not NRI.She is staying in India.I have a query,correct me if I am wrong. If I am NRI,the NRI status is applicable only for me not for entire family.As my wife continue to stay in India,she will not become NRI.Hence how my wife can not open PPF account on her name ? As your original query was – ‘Can I open PPF account on my wife name ?’ Hence replied that you can not open PPF ac. However, if your spouse is a Resident Indian, she can open PPF account. Thanks Sreekanth for quick reply. I now am in possession of canadian PR and will be leaving the country for good in march. Will i be eligible for withdrawal? I don’t intend to come back. As of now you are a Resident Indian. The above notification is applicable for NRIs only. 2) Whether, the PPF contribution made in April 2017 will qualify for the deduction under 80C for filing income tax return for AY2018-19 by NRI for the income from property in India. 1 – I believe that this notification is not retrospective, checked this with few CAs too, they are also of the same view. So, date of Gazette notification is to be considered for calculation of PO savings interest rate. 2 – It should be , as during that period, NRIs can contribute to existing PPF accounts. I am an NRI, who is staying in abroad from 2000. I have invested in NSC & KVS certificates in India which will mature by next year. Now I need to close immediately OR wait to mature ?? As of now, this notification is applicable to PPF & NSCs only. You may close NSC after checking with your PO branch. If I became NRI in 2007 and I go to close my PPF account say on 30th November. Please clarify that the bank will credit interest @ 4 % only for the period 3/10/17 till 30/11/17 and not from 2007 when I became NRI. From 2007 till 3/10/17 bank will not recalculate the interest rate to 4 % ! Thanks for your help. Dear Sunil..Kindly go through my below comment in reply to the query posted by dear Sanjay.. Thanks Sreekanth. I contacted my bank where me and my wife have PPF account. They said that they have read in the news paper about the new notification but they have got no official letter from RBI in this regard. Hence they cannot close our PPF accounts ! This is very frustrating now. Please advise what can be done. Thanks in advance for your kind help. Suggest you to kindly wait for few days, I am sure your banker will receive the required guidelines on this! Also, I am confident this notification can’t be made retrospective! I opened PPF account in 1999 and it got closed naturally in APR 2014. I became NRI in 2006. When I approached bank today for closure of PPF account, they mentioned that, they will re-calculate interest from the period I became NRI, which is in 2006. Since the GOVT notifications is issued in Oct 2017, i believe post office interest should start from Sep 2017 (As per the notification). Is there any clarification available which makes it clear that bank should not recalculate earlier interest paid and updated in passbook but align interest rates to post office interest rates from Sep 2017 only. What should I share with the bank to make it clear. Will it require govt clarification? As per old rules, till Sep 2017, NRIs were allowed to contribute to existing PPF accounts and the regular applicable rates are payable. If a resident Indian turns NRI then savings bank rate is payable from Oct 2017 only as the account is deemed to be closed, till Sep 2017, ideally ppf rates are payable. But there are conflicting views on this, we may have to wait for few more days until the govt/CBDT clarified on whether the rules are applicable retrospectively or not.. If this is applied retrospectively – So, if someone has left the country say 8 years ago, his/her PPF a/c will be treated as closed retrospectively, and he will be paid PO savings bank rate only from the time he turned NRI. Then, how will the money be recovered from his account? as the normal PPF interest rate would have already been paid/accumulated. Will they deduct the interest from future interest payments? ?Or will bank/PO re-calculate the payments as being done in your case – definitely more clarity is required.. The Government of India rules and regulations are such that the left hand does not know what the right hand is doing. Normal citizens like us are stressed up as there is no clarity. Some govt department issues the rules to be followed with immediate effect whereas the implementation system is not in place. For example the banks do not know if they are allowed to close NRI PPF account as they have not received any formal communication from RBI. It is over a month now after the new rule was published in the gazzette ! My son is an NRI since 2013. he opened his PPF account in 2009. As per the new rule from when does the 4% interest apply? Is it from 3rd Oct 2017 when gazette was published or from Jan 2013 when he became a NRI. 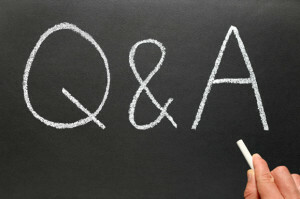 Thanks for such a good article , most of the important questions have been asked by other readers already. 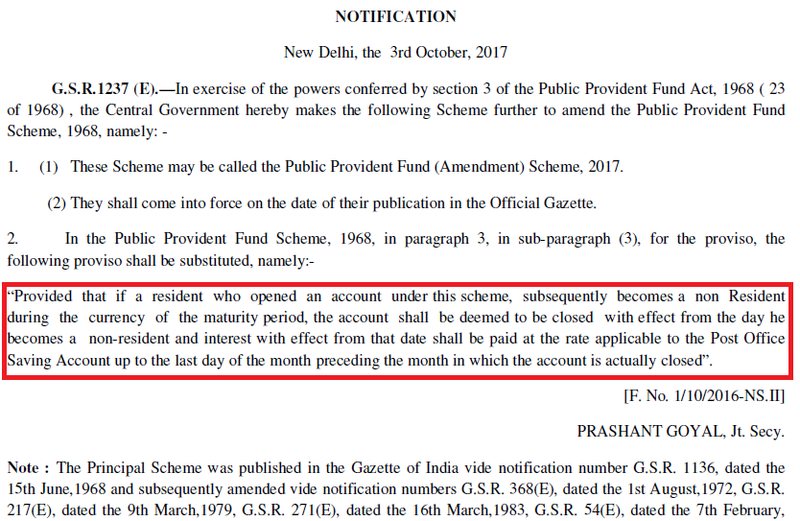 One more point – in PPF usually you can not withdraw before 5 years (lock-in period) in this case since Govt. is asking NRI’s to get the account closed and giving prevailing interest rates till 2nd Oct 2017, do you see this payout/withdrawal going to have any tax implication due to closing account before serving lock-in period? As of now there is no clarity regarding this, but I believe that the payout should be tax-exempted. As the amendment takes effect from the date of issue that is 3/10/17, please clarify and confirm that even though the status may have changed earlier, it would be deemed to be closed only on this date and does not have retrospective effect in respect of the current PPF accounts of NRIs. Dear VEERARAGHAVAN.. Yes, I believe that the accounts are deemed to be closed w.e.f oct 2017 only, though the residential status might have changed to NRI before this date. Because, before this notification, NRIs were allowed to deposit in PPF/NSC and regular interest has been credited. I live in Canada and is citizen of canada. I am nri since July 2003. Me and my wife has a ppf account in Ludhiana. I want to close both the accounts. Do I have to be in India to close both accounts? Is it possible to close the ppf account without visiting India? You may kindly check with your service provider. I believe that Govt should provide an online provision for NRIs who want to close the PPF accounts now.. I am an NRI, who is staying in abroad from 2006. I have a PPF account in India which was opened in 2005 when i was in India. Subsequently i became citizen of Canada in 2010 but i continued my PPF account as it was allowed until its maturity of 15 years. now the rules changed. what will be the effect on my account? Is it that, i will get minimum interest from 2006 the year when I left India ? You will get regular PPF interest till Sep 2017 (the notification has been issued in Oct 2017). From now, your PPF a/c is deemed to be closed and till you actually close the a/c, it earns only 4% (current PO savings a/c rate). On which date it is considered as status changed to NRI? At present I’m in abroad from April 08th 2017 & will be returning in July 2018. I came for 6 months, but because of the project extension my stay extended so I have not changed any of account ( say demat or Savings account). Whether I will face any issue here? I have PPF account in SBI, but how the bank knows about my stay & whether we need to inform them? Kindly use this calculator to know your Residential status. If your RS turns NRI, you need to update the same with your banking relationships. I am an NRI, who is staying in abroad from 2016. I have a PPF account in India which was opened in 2015. In the Gazette they didn’t mentioned anything about how funds can be withdrawn ? Or will they automatically closed and funds will be deposited to any related savings account or do we get check instead? I had called customer service of bank which have my ppf acct ,but they don’t have enough info as well in this topic. As per the notification, the PPF a/c is deemed to be closed when the investor’s residential status changes to NRI. I believe that ‘automatic closure’ of account may not be available and the depositor has to manually (offline/online) close the account, until then from the date of change of Residential status till the account is closed, nominal RoI of PO savings account will be provided. 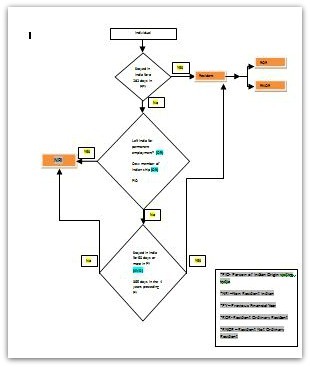 Your banker may take sometime to provide the required details as this is the latest development.. Thanks for quick response 🙂 .. So seems we need to wait for bank to implement online closure of PPF.